Halina describes her life in Poland and Russia during the war and how she eventually came to Scotland. INT: Could you tell us when and where you were born and what was your name at birth? 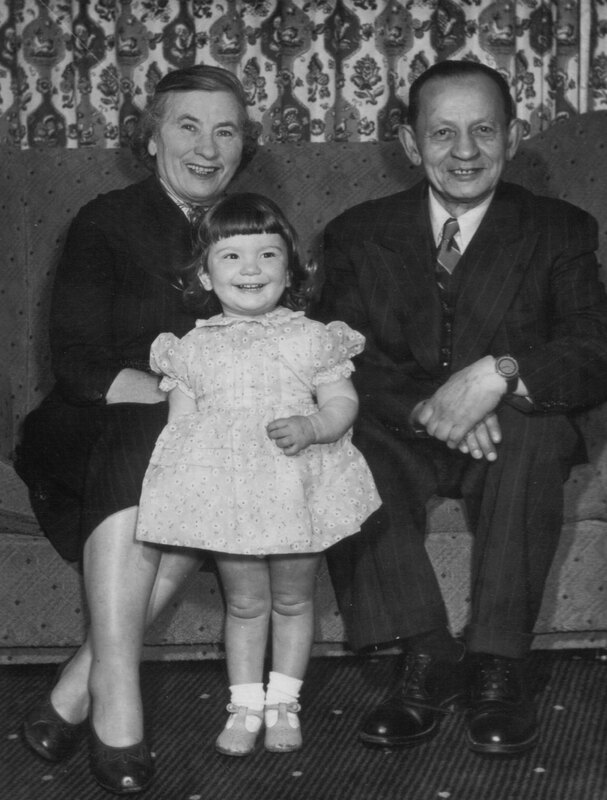 HM: I was born in Warsaw and my name at birth was Halina Lewiner (L E W I N E R) INT: When did you come here to Scotland? HM: I came to Scotland to stay permanently on the 9th of December 1947, but I had been here before just before the war. INT: What age were you when you came in 1947? INT: Why did you come here to Scotland and how was it possible? HM: Well I came here with my parents. My mother had a sister in Glasgow. She and her husband made great efforts to get us over to Glasgow, because the situation in Poland was getting a bit untenable. The communist regime was encroaching. Various friends of ours got arrested and held for days at a time and a lot of them left Poland but they didn’t go officially because they couldn’t, they had no relatives like we had. They just went across the illegal border to Czechoslovakia, to Germany, but we were lucky because we had relatives who sent us genuine visas. And that’s how we got here. INT: And where did you stay? Did you stay with your mother’s sister? HM: Yes, we stayed with her for a while but we moved out after a couple of months. INT: Did your family find work here? HM: My father found a job, a very lowly job of course, very poorly paid but a job nevertheless. And my mother tried to make a living out of dressmaking but it just didn’t work out because she was too high a class of dressmaker. She couldn’t really compete with the ready-mades and she didn’t get enough of the higher class of customer. She had a few who were very pleased with her, but she couldn’t expand because she had no backing really, but she did manage to make a few pounds here and there with dressmaking. INT: What were your impressions of Scotland? HM: Well I had already been before, you see, and I was a great Scottish and Polish patriot and I was so delighted that Poland and Scotland had some connection through the mother of Bonnie Prince Charlie. She was a Polish princess, and I had known this since I was nine! I loved it here. When I was returning to Poland, my school friends clubbed together to give me tartan presents. Before the War we came because my Auntie, my mother’s sister was pregnant and she had a little boy and she felt she could do with her sister’s company. My father didn’t come then, just myself and my mother and after a month they decided that they had enough of me under their feet and they sent me to school. So I went to Shawlands Academy for about five months and I learnt English beautifully without the slightest trace of an accent, which I’m afraid is not the case now! INT: So you think you’ve lost your good Scottish accent? HM: I had a good Scottish accent and what’s more I could read and write with perfect spelling. I know that because my aunt kept my letters and I found them after the war and I spelt words like ‘caught’ and ‘would ’ perfectly. I still have them. INT: What age would you have been? About fourteen? HM: No, I was about nine. HM: Nine. I had my tenth birthday in Glasgow. HM: We went back to Poland. We had stayed six months in Glasgow and then we travelled a bit in England, and then France and then we left France on the 14th of July, just after the celebrations of the 14th of July. Six weeks later the war broke out. INT: Your father must have been quite worried though? HM: He was and that’s why we went back partially because he kept writing, saying, “What are you doing there?” and “I am lonely, come back” but there were other reasons why we went back. My mother didn’t intend to stay here really because she had a thriving dressmaking business near Warsaw, in a small town where we lived. And, war was in the air. We listened to Hitler’s speeches on the radio and the radio nearly jumped off the shelf because he was so loud, and the Heil Hitlers and everything, and the barrage balloons floated over Bellahouston Park and they were practising with, what do you call them, lights? HM: Yes and they intercepted aircraft so we knew war was on its way but we just didn’t really believe it, not quite. My mother just couldn’t make up her mind but finally she decided we would go home. But my mother had an idea, at least she had two ideas, which she chased; she chased both ideas, quite different ideas but she chased them both (my mother was very energetic). One was to get to Vilna which was in a neutral country then. Lithuania was still a neutral country and was not absorbed either by Germany or by Russia. From Lithuania you could apply for a visa to Britain or to America. 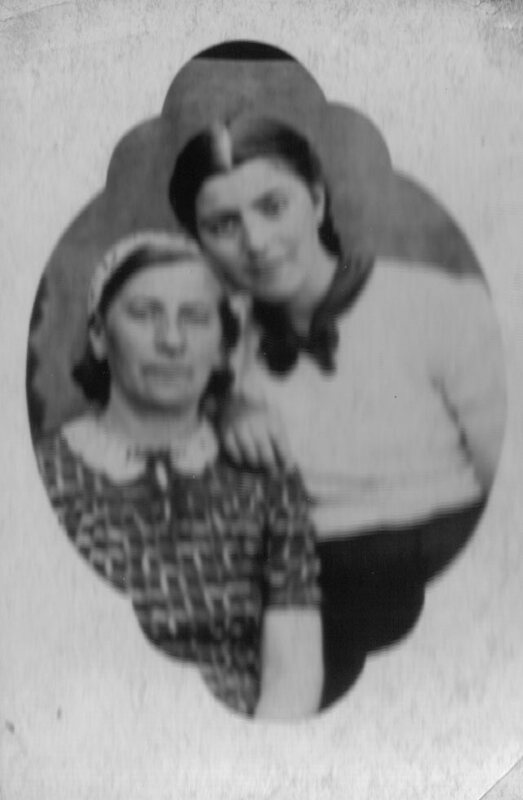 Lots of people went and my mother said to we will be in Vilna, wire Auntie Hannah and she will promptly send us visas and off we’ll go to Britain. On the other hand, she had a sister in Moscow who had emigrated to Moscow in the 1920s. She wanted to get an education in Poland but she couldn’t because she was too poor. In Russia, just after the Communists won, after the Bolshevik Revolution, education was open to all and she was longing for an education so she went there. Actually, my mother’s brother went even earlier so she went to join her brother and that’s how she was in Russia. After a while she couldn’t come back to Poland. They wouldn’t let her out. So she kept up a correspondence with my mother and her own father but after a while, about 1938, the correspondence stopped. There was nothing. 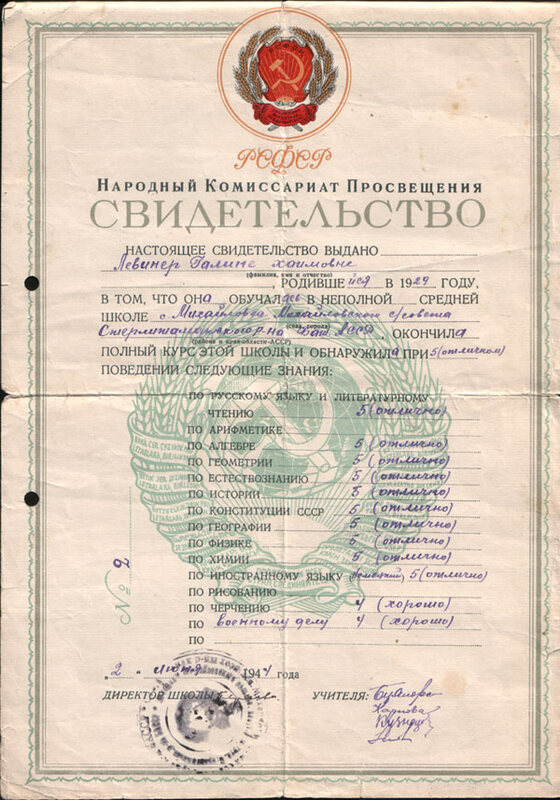 My mother wanted to see both her brother and her sister in Moscow so she started applying to the various institutions, the various offices in one of the Russian authorities. That was the Russian approach. In fact later we on, we discovered that my uncle, the brother, was no longer alive. He had been arrested in 1937 in the big Purges and he was shot in the service of capitalism. My auntie was afraid to write about him but it was later, during our stay in Russia we discovered all this. So you wanted to know how we got into Russia? At the start of 1940 there was no question of going to Lithuania because Lithuania was annexed by Russia so that path was closed to us. We couldn’t go to Moscow but there was a chance to register for a return back to your own home. The Russians declared, all the refugees must register either to receive Soviet passports or to go home. 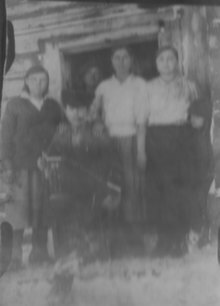 My father decided (we were still living separately) [they were in Bialystok at this time) he decided that he would go to back to Warsaw. He was fed up with Russia, being forever arrested and released and forever persecuted/ prosecuted. He’d rather stay at home and whatever happened with everybody would happen to him. But my mother still had this dream of going to Moscow so she applied for a Russian passport and I was on it. One day the NKVD came for us in the night of June, I forget which date, in 1940. They said to my mother, “Well, we’ll have to take your husband away but you and the girl can stay” but my mother suddenly became very brave and said, “Wherever my husband goes, I go and that’s how we got transported by cattle trucks, a journey of about 12 days, far into Northern Russia, and that’s how we did not get put into gas chambers or shot by the Germans. INT: So in other words, your father who had said he wanted to go back to Poland, ended up being Russian or made into a Russian citizen like your mother and you? NT: So was it Siberia you ended up in? HM: Well it used to be known as Siberia because it was a place where politicals used to be deported but it wasn’t actually Siberia, geographically it was actually still Europe. It was nearer Archangel. INT: Up north, near Japan then? HM: No, nearer Finland. INT: So how long were you there? HM: Well we were in the Archangel area for about a year and a half and while we were there the Germans attacked Russia. We were detainees before the attack but once the attack happened, we were allies. Suddenly so from not being able to go out of the settlement any further than a five kilometres radius, we were told we could go anywhere we liked, we could do anything we liked. By then my Auntie, my Moscow Auntie, had been evacuated to another place called Bashkiria, which was near the Urals which was almost in Siberia and all the inmates of this settlement near Archangel were going to go out. They had had enough of that very cold place where we were forced to do labouring in the forests and so on. They were going to go somewhere where there was some food; food was short and it was cold, they were going to go somewhere where it was warm so they all went to central Asia, except my mother and me because we knew where we were going. We were going to Bashkiria to join my Auntie from Moscow. INT: It must have been bitterly cold I would imagine? HM: Yes in both places. Near Archangel the temperature could go down to minus 55. HM: But we lived in a valley so there was no wind so it was bearable, just about bearable but in Bashkiria we were living in the Steppe and the temperature minus 40 was quite common. Usually it was minus 25, minus 26. INT: With a horrible, cold wind? HM: There was a wind, yes, and sometimes it would whip up the snow. You couldn’t see, whirling snow everywhere. There were two memorable days while we were there when the temperature dropped to minus 65. INT: My goodness, I couldn’t conceive of that! You couldn’t go out in a temperature like that? HM: No but you had to. You had to go to the bathroom, you didn’t have a lavatory in the house. INT: Did you get an education there? HM: Yes, the first thing I did was to go back to school. To begin with there was no school in the Archangel settlement when we got there. The men were required to go tree felling, lumber jacking in the forest. The women and various other able bodied people had jobs. My father was over 50 so he was not required to fell trees but he was required to be out, collecting the branches and making big bonfires out of the branches. He and a sixteen year old boy did this, and I think they quite enjoyed it. But after a while he was dragged away to jail. That’s another long story. INT: I thought you were all on the same side by that point, why was he jailed? HM: Well, long before the Revolution and even after the Revolution for a bit, he was politically engaged and in fact he was deported, in exile, in the same area near Archangel by the Tsar; he got detention for three years without a trial because they didn’t have enough evidence against him but they did want him out of Warsaw so he was given three years of detention in that place that was known as Siberia but was actually near Archangel. He spent a very interesting three years there. He was imprisoned with the wife of Trotsky, and various other well known personalities. 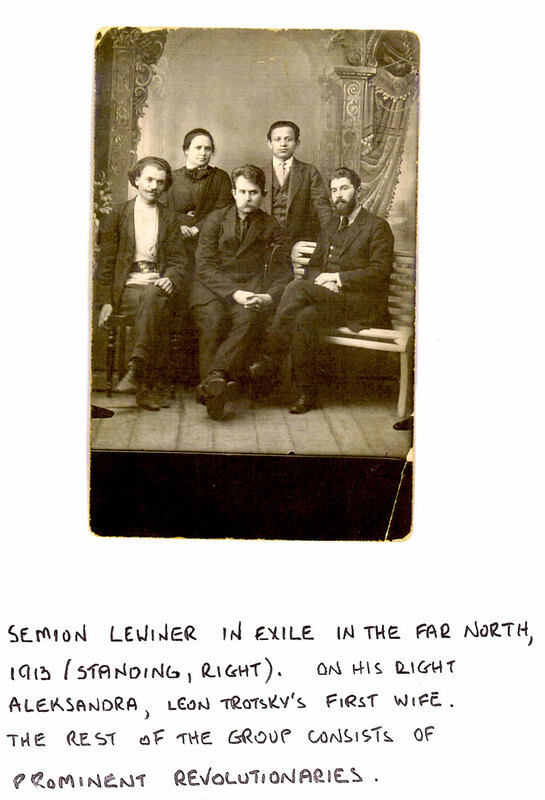 I’ve got a photograph which we always had in the family and when Trotsky’s biography came out, on page 8 there was the photo with my father in it. INT: But if he was with Trotsky, was he not a Communist then? HM: My father? No, he wasn’t a Communist, he was a Bundist. I don’t know whether you know what a Bundist is? INT: Ah yes, that’s the German Jewish Trade Union Movement? HM: No not German. No it was called the Bund of the Jewish Workers of Russia, Lithuania and Poland. INT: I see, not German. HM: Bund simply means a union and it was an organisation which was non-Zionist but nationalistic which wanted better conditions for Jewish workers of whom there were a lot. Not only material conditions, but also cultural autonomy for Jews. In other words Jewish institutions should flourish; it was secular, was non-religious. It was anti-religious, anti-Zionist but pro-workers so it was a socialist organisation and he was very active in it when he was young but the activity sort of tailed off. But the Russians didn’t forget about it and that’s why he was harassed while we were in the occupied Polish part. That’s why he wanted to go back, because they harassed him and then when we were in detention up North, someone tipped off the authorities. (I’ve got it all written up you know, somewhere). There was a bit of an uprising in the settlement; the young protested that they were working and they didn’t get enough to eat and they didn’t want any money, they wanted food for themselves and the children. The Russians considered this a revolt and these young people were all arrested but one of them seems to have said to the interrogating officer, “Oh you are arresting us, we used to be Communists in Poland and there’s this Bundist and you haven’t touched him” so they went and got my father too, dragged him in. INT: So was there quite an age difference between your father and your mother? HM: Yes, my mother was 8 years younger. When my father came from the detention in Russia under the Tsar he was 26 and he met my mother and my mother looked at him and she said, “Oh, a hero of the Revolution” and she thought he was wonderful. He was quite good looking too so they got engaged; he was 28 because my mother was 20 when they got married. INT: So there you are, stuck in Russia and how did you manage to get to Scotland? HM: Once the war between Russia and Germany, was underway, there was a Polish government in exile in Britain and this Polish government in exile demanded that the Russian government allow all the Polish citizens in the territory of Russia, who were in detention, to be allowed out, so my father was allowed out of jail. Why don’t you become Soviet citizens” he would say, “Well we can’t because we can’t have dual nationality and I don’t want to relinquish Polish nationality”. “Oh you’re Polish, well prove it” so he kept doling out little documents, whatever he had to show he was Polish so at least they knew we were Polish and there was a rumour that we were going to be repatriated, which we eventually were. Poland, at the beginning, soon after the war, was still reasonably democratic so we could communicate with my Auntie Hannah from there. When I say ‘we’ I obviously mean my parents because I was just a child really. INT: And they eventually arranged for her to get you a visa to come here? INT: Yes? And that’s where we started! HM: Yes, we came legitimately here without too much trouble.